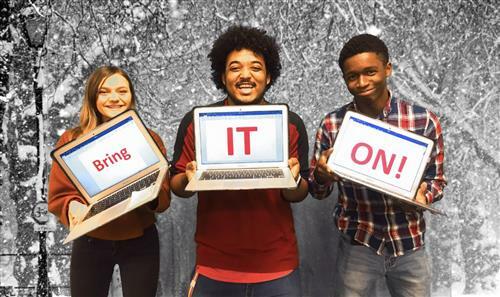 Spartanburg School District 7 is one of five South Carolina school systems that was selected by the Education Oversight Committee as part of an eLearning pilot program for the 2018-19 school year. When we experience a disruption in regularly scheduled school days, such as due to inclement weather, and traditionally would have to cancel school, District 7 students will now be able to continue their lessons at home via eLearning. In addition to avoiding breaks in the learning process, the use of eLearning days is less disruptive for families’ schedules since there are no make-up days to be implemented. Virtual eLearning Days allow students to minimize the interruptions caused by bad weather days and continue to make educational progress. Students will have regular assigned classwork on eLearning Days, and their teachers will be available electronically. Students will be required to complete and submit all assignments as well as communicate with their teachers during the virtual eLearning days. Teachers will be expected to make contact with students, track virtual attendance and be available to students during virtual office hours. For more information on eLearning, see the links to the left.